Extend genome editing capabilities to cutting edge in vivo applications with our Two Vector AAV Cas9 SmartNuclease gRNA Expression Plasmid EF1α-RFP-U6-gRNA(SA). Bringing together the versatile CRISPR/Cas9 genome editing system with powerful recombinant AAV (rAAV) technology, SBI’s AAV Cas9 SmartNuclease™ vectors extend genome editing capabilities to cutting edge in vivo applications. For situations where you would like to introduce saCas9 and gRNA separately, SBI offers a Two Vector AAV Cas9 SmartNuclease System with saCas9 expressed on one vector using the strong, constitutive EF1α promoter (EF1α-hsaCas9 Two Vector AAV Cas9 SmartNuclease Expression Plasmid, Cat# CASAAV200PA-1) and gRNA expressed on a separate vector using the U6 shRNA promoter (EF1α-RFP-U6-gRNA(SA) AAV Cas9 SmartNuclease gRNA Expression Plasmid, Cat# CASAAV300PA-1). Please note the “How it Works” section below, which provides instructions for the slightly different gRNA design needed when using hsaCas9. With their broad tropism, the lack of disease associated with wild-type virus, ability to transduce both dividing and non-dividing cells, and long term transgene expression, recombinant AAV (rAAV) has recently become the method of choice for delivering gene therapy and genome engineering vectors to intact organisms1, 2. However, for efficient packaging, inserts into the region between rAAV’s two ITR sequences must be less than 5 kb. The development of CRISPR/Cas9 has already revolutionized what’s possible when it comes to manipulating the genomes of even complex organisms. However, in vivo delivery via rAAV vectors has been hampered by the size of the Streptococcus pyogenes Cas9 gene (spCas9), the most widely-used form of Cas9. To overcome this problem, Ran, et al,1 characterized smaller orthologs of the Cas9 gene and found that Cas9 from Staphylococcus aureus (saCas9) performs as efficiently as spCas9 while being ~1 kb shorter, enabling insertion into rAAV vectors. With advanced rAAV systems and a range of easy-to-use Cas9 vectors and kits, SBI has the expertise to combine these two technologies into a single, easy-to-use, and powerful system. Choose from our All-in-one or Two Vector systems to drive your in vivo genome editing studies into high gear. Vasileva A and Jessberger R. Precise hit: adeno-associated virus in gene targeting. Nat Rev Microbiol. 2005 Nov; 3(11):837-47. PMID: 16261169. Petrs-Silva H and Linden R. Advances in gene therapy technologies to treat retinitis pigmentosa. Clin Ophthalmol. 2014; 8:127–136. PMCID: PMC3878960. Ran, F. A. et al. In vivo genome editing using Staphylococcus aureus Nature. 2015; 520:186–191. PMCID: PMC4393360. While saCas9 is just as efficient as spCas9, a few differences between the two systems will affect gRNA design1. Contact us with any questions on gRNA design for saCas9 or about using our AAV-Cas9 vectors by emailing tech@systembio.com. Your AAV Cas9/gRNA virus is ready for your genome editing project. Both SBI’s all-in-one AAV-Cas9 and two-vector AAV-Cas9 systems efficiently correct a dysfunctional genomic copy of EGFP. Starting with an Enhanced Green Fluorescent Inhibited Protein (EGIP) reporter cell line, which has an inactivated EGFP due to a premature stop codon, we designed a gRNA sequence and HR rescue donor to remove the stop codon and enable GFP expression. 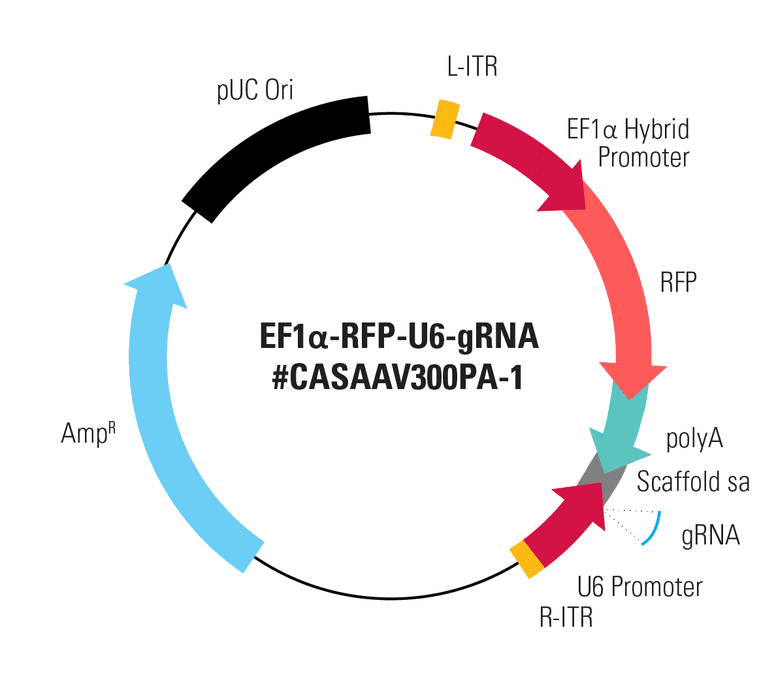 The gRNA sequence was inserted into either Cat # CASAAV300PA-1, EF1-RFP-U6-gRNA(SA)—the gRNA-expressing plasmid in the Two Vector AAV Cas9 SmartNuclease System (Figure 1, top panels)—or Cat # CASAAV100PA-1, the EF1α-hsaCas9-U6-gRNA(SA) All-in-one AAV Cas9 SmartNuclease Plasmid (Figure 1, bottom panels). AAV virus particles isolated from both cell lysates (Figure 1, left panels) and packaging supernatants (Figure 1, right panels) were delivered to cells with the rescue HR donor and restored EGFP expression, indicating successful genome editing. Delivery of AAV plasmid(s) alone (Figure 1, middle panels) with HR donor also restored EGFP expression, again indicating successful genome editing. Figure 1. Both SBI’s all-in-one AAV-Cas9 and two-vector AAV-Cas9 systems efficiently correct a dysfunctional genomic copy of EGFP. METHODS: Approximately 1 – 1.5 x 106 EGIP reporter cells were seeded into a 12-well plate for infection with isolated AAV particles (left and right panels) or transfection with plasmid (middle panels), along with the HR rescue donor. The top panels were treated with the Two Vector AAV Cas9 SmartNuclease System plus HR rescue donor designed to correct the defect in EGIP, restoring EGFP expression. The bottom panels were treated with the All-in-one AAV Cas9 SmartNuclease Plasmid plus the same HR rescue donor. Three days post-infection or transfection, EGFP-positive cells can clearly be seen, indicating successful genome editing.